SOUTHWEST ASIA–(ENEWSPF)–April 2, 2017 — U.S. and coalition military forces continued to attack the Islamic State of Iraq and Syria yesterday, Combined Joint Task Force Operation Inherent Resolve officials reported today. Near Raqqa, five strikes engaged four ISIS tactical units; destroyed eight barges and five fighting positions; and suppressed an ISIS tactical unit. Near Palmyra, two strikes destroyed three ISIS command-and-control nodes, three supply caches, a checkpoint and a bunker; and damaged bunkers. 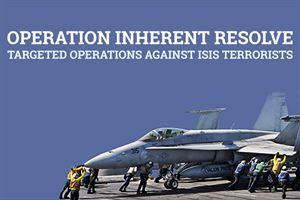 Near Tabqah, two strikes engaged an ISIS tactical unit and suppressed an ISIS tactical unit. Near Kirkuk, a strike engaged an ISIS tactical unit. Near Mosul, six strikes engaged seven ISIS tactical units and an ISIS staging area; destroyed three rocket-propelled-grenade systems, three fighting positions, a heavy machine gun, an artillery system, a weapons factory and a vehicle-borne-bomb factory; damaged seven supply routes and five fighting positions; and suppressed 12 ISIS mortar teams, four ISIS tactical units and an ISIS sniper team.